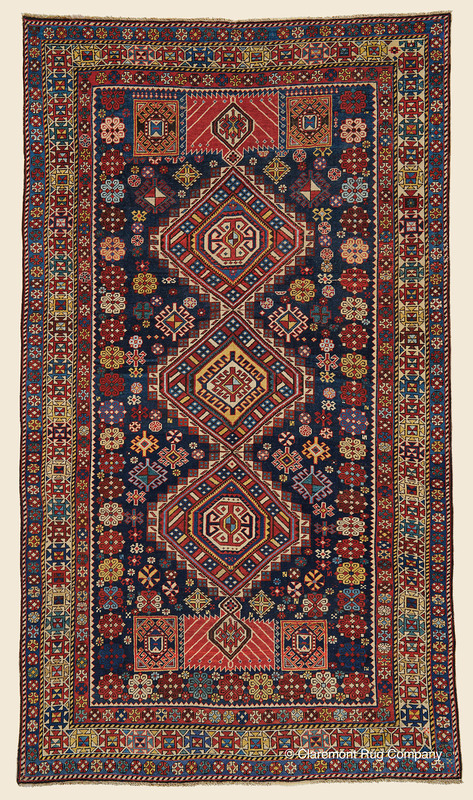 Search Our Inventory / All Rugs / 4&apos; 9" x 8&apos; 3"
(High-Decorative) (�Spring 2019 New Acquisition�) A dazzling array of color and archetypal symbols creates a palpable sense of joyfulness and celebration in this finely crafted antique Caucasian Shirvan rug. From the regional tradition that uses mesmerizing hexagons in a column format, it is a wonderfully preserved, precious piece of tribal art. Throughout, the design�s naturally dyed colors are beautifully saturated and incredibly diverse, presenting a blue range of azure, cobalt, and sapphire tones as well as uncommon flashes of saffron, ochre and ruby. In a creative flourish, a chain of rarely used pinwheel motifs is employed by the weaver to surround three sides of the field, but not the uppermost edge.